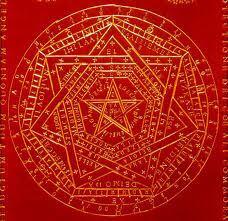 Lets get to the basics of Enochian Magic. Throw away the Golden Dawn and Crowley, and read what Ave says. Ave in my opinion is a masked demon calling himself an angel. Is that not the game a demon would play on man to get his plan accomplished? The Enochian communications teach us that not only must humanity itself initiate the cosmic drama of the apocalypse through the magical formula delivered to John Dee and Edward Kelly more than four centuries ago, but humans must also be the physical actors that bring about the plagues, wars, and famines described with such chilling eloquence in the vision of St. John. We must let the demons of Coronzon into our minds by means of a specific ritual working. They will not find a welcome place there all at once, but will worm their way into our subconscious and make their homes there over a period of years or even decades. In the minds of the individuals that resist this invasion, they will find it difficult to find a foothold, but in the more pliable minds of those who welcome their influence, they will establish themselves readily. We see this same theme come back around in about 1919. Rudolf Steiner gives a lecture about the Incarnation of Ahriman. In the same lecture Steiner does review the Luciferic Powers coming from China but doesn’t reveal its Lao Tzu, whom is considered the Luciferic Teacher aka the Incarnation of Lucifer. The Christ impulse is the balancing act. The Incarnation of Ahriman, per Steiner will accomplished and nobody will know. To quote Steiner’s work as to the relevance of the topic. This should give the final pieces of the puzzle to the Church of Ahriman’s theology. It would be easier to read the Bible of Corruption. One man’s God is another man’s Devil! This entry was posted in Church of Ahriman, Left Hand Path, Occult, Ritual Magic and tagged Adam B Daniels, Ahriman, Angra Mainyu, Bible of Corruption, devil worship, Enocian, Enocian Magic, freedom, Kelsey Daniels, Mobed Kelsey Daniels, Pope Robert Fraize, Satanist, Theistic Satanism, traditional satanism, Vedic Hinduism. Bookmark the permalink. It’s really a great and useful piece of info. I’m satisfied that you shared this useful information with us.